the history of the flea markets in the city of light. Their origins go back to the junk trade a few centuries ago. The archbishop of Paris gave the OK and flea market historians tell us , rag and junk merchants ( some were called chiffoniers) were given a very limited right to sell their wares ( rags & bits of used items of all kinds). In the 19th century merchants were asked to move outside of Paris ( reasons of hygiene). At night they would gather up discarded items of every kind that they would recycle or transformed into something useful – scrap metal, broken glass ( to remelt for windows), fat for candles, old bones into buttons, and all kind of cloth ( from the most rough material to the very finest silk) to be used for all kinds of purposes. In 1883, a city official by the name of Poubelle ( used now for the word garbage can) came up with a health measure, which was the requirement that garbage receptacles in Paris be sealed, putting the livelihoods of these chiffoniers at risk. They protested because they had very limited access to the bins at certain times. Also in the meantime, rents in Paris had become prohibitive for many of these scrap dealers who began to move their operations in the periphery, also around Porte de Clignancourt. From what I have read, a scrap-metal market was taking place in St-Ouen, the nearby commune. So the concept of the flea markets, as we all know today, evolved from these origins. The rich Parisian bourgoisie had accumulated a lot of possessions that were out of fashion provided fodder for merchants. In the 1800’s a small group of chiffoniers got together between the city of Paris and the commune of St-Ouen and began offering a public that was extremely curious, some of the wares they had collected. A trend was starting to emerge and people from other parts of Paris would come to St-Ouen to have a look at this very new phenomenon. All kind of objects were sold at these primitive outdoor markets ( that is when the expression marches aux puces began to be used). 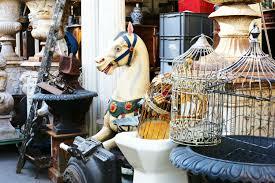 The markets would sell old furniture, linens, clothing, books, dishes and other merchandise at random. The St-Ouen market was a very festive affair where people would gamble, play games in the midst of the brocante. By 1908, one could get to the brocante by metro only in a few minutes. Around 1920, the first permanent markets at St-Ouen were installed – First the Marche Vernaison and then soon after the marche Malik. Others followed over the next few years and then decades. 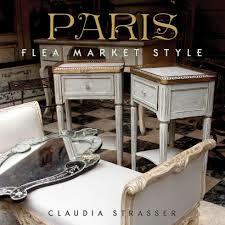 Flea markets elsewhere in Paris developed in a very similar fashion. The Porte de Montreuil market began when rag and junk merchants were driven from the center of Paris towards the East and it really took hold after world war one. The Place d’Alligre from what I have heard was already the site of a clothing market before the French Revolution and has continued in this way into this century. It has recently evolved into a general flea market, in which bric-a-brac and other things besides secondhand clothing and old linens are sold. In the sixties, the hippie generation made the wearing and use of secondhand goods a kind of mantra of their age. The flea markets of Paris are year around, the best time to go would be spring or fall and I do not recommend Summer when heightened pollution, influx of tourists & the heat make it difficult to enjoy. Also in August a lot of shops & restaurants are closed. The flea markets of Paris are not always limited to weekends, Place d’Alligre is held every day except Monday; the Place de la Bourse market takes place on the last Friday and Saturday of the month. Both Porte de Montreuil & St-Ouen markets are held every Monday in a diminished form ( just a few merchants) as well as on Saturday & Sunday. The weekend is always the best time to go to the flea market, that is when the Porte de Vanves market takes place, a favorite of a lot of Parisians. The Place de la Bourse, Porte de Montreuil, and the Puces de St-Ouen are all day affairs. I like the Puces de St-Ouen where you can find the most high-quality and high end items.But I will admit that in terms of beauty and ambiance, these flea markets take place in places that are not wonderfully quaint neither are they picturesque in case you just want to stroll along or relax at a nearby cafe. The most visually appealing markets are the Porte de Vanves and Place de La Bourse and Porte de Montreuil and around St-Ouen are not very attractive and the Place d’Alligre is not one of the finer squares in Paris. If your goal is to browse and buy then it’s fine & you won’t be disappointed, but if you want to look for photo opportunities, just forget it. These markets are for very serious foragers, if you have brought the family along and they are not into flea markets, they have many choices of things to do in Paris. Porte de Vanves, Place de La Bourse or even St-Ouen markets are where the extraordinarily high-end nature of the wares definitely offsets the unappealing environment. Prices reflect the level of the market, if for example you find something interesting at Porte Montreuil or Le marche d’Alligre, the price will be cheaper than at Place de La Bourse and especially at The St-Ouen markets. Also you will find Quimper wares much cheaper in Paris than in Brittany and I think the reason behind the pricing is that there is a lot to choose from in Paris. 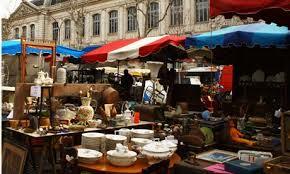 Bargaining is part of the Flea market language in Paris or else where in France. You can get a 10 to 15 % off from the original asking price. Parisians are definitely used to tourists, but if you speak some French you will find out that it does not necessarily hamper your bargaining success. The best way to go to flea markets in Paris is to take the metro because all these markets , both Place de la Bourse and Marche d’Alligre are in the center of Paris.The first is at a metro stop and the second is at about 5 to 7 minutes walk away. To let you know, driving in Paris can be a nightmare, both to drive & park and taxis are neither cheap nor particularly time saving. I would recommend to visit Portes de Vanves, whatever your collecting interests are. If you like high-end antiques and collectibles or if you have an interest in the flea markets as an historical phenomenon, spend time at the St-Ouen markets. Also another idea for people visiting Paris, you can always hop on a TGV and take day trips to flea markets in Rouen, Orleans and Tours , they all have great flea markets and they can be reached in an hour or so. Also the advantage of taking the TGV is that you do not have luggage so you can move around freely. You can fit in a lot in your schedule and after visiting the flea market you can go back to Paris sometime in the evening. Also all train stations are on the metro lines, so getting there and back is pretty simple. Also always wear comfortable shoes! Luxury Travel Consultant2 will offer a free trip to the one person who can bring 11 friends together for a flea market adventure in Provence. For more information contact anne@luxurytravelconsultant2.com. We customize tours, just for you. Nimes ( Ave Jean Jaures) 80 vendors. ( 8 am – 6pm) note that many vendors leave by noon. Wednesday Arles ( boulevard des Lices), about 80 to 100 vendors; First Wednesday of the month. Friday, Toulon ( Place du Theatre) 15 to 20 vendors, 9 am to 5pm. Nimes ( Parking du Stade), about 80 vendors, 8am -4pm, * some vendors leave early. Some of the flea markets that I have chosen to include are Aix en Provence, Arles, Avignon, Isle sur la Sorgue, Nimes and Villeneuve-Les-Avignons. The markets run the gamut in size, range of things sold, and schedules. Aix en Provence ( Tuesday, Thursday & Saturday morning. What you will find are books, paintings. jewlery, ceramics, some furniture, rustic items. 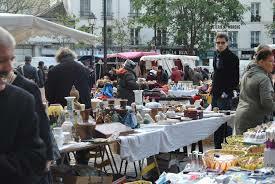 There is a brocante market in Aix en Provence every Tuesday, Thursday and Saturday morning from 8am to 12 :30 am, ( Place de Verdun) located in the center of Aix, in the pedestrian maze of streets to the north of cours Mirabeau. There is parking along the streets and if you arrive by train, the market is just 20- minute walk northeast from the train station. You will head north, along street G.desplaces, then turn right on Avenue des Belges to the Place du General de Gaulle. Then you follow La Cours Mirabeau east, turning left north just the place Forbin at the end of the cours, onto the rue Thiers, which will take you straight into Place du verdun. Arles ( First Wednesday of the month) 80 to 100 vendors. What you will find Provencal clothing, accessories, fabrics and lace, ceramics, toys and some furniture. 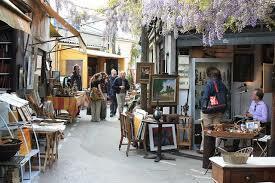 Arles has an all-day brocante market on the first Wednesday of the month. 8am -6pm. This market takes place at the south end of town below the Jardin d’Ete, along the boulevard des Lices. If you drive metered parking is available. If you get there by train, you will realize that the market is at the end of town , the walk is not that long ( 25 minutes). Head south and then near the end , go a little east and keep south again on rue de la cavalerie, which will turn into rue Voltaire and will take you into the Arles arena. Still keep south, at the other end of the arena on rue La Porte de l’Or which will take you to the jardin d’ete. The market is at the south end of the garden. Avignon, you will find kitchenware, tools, hardware, books, records, secondhand clothing. The flea market takes place on Sunday mornings, 6am-12:30 pm. Place des Carmes in the center of Avignon. If you drive there you will find free parking around the ramparts, eastern end , at the Porte Saint- Lazare and you can walk a short distance along the rue Carreterie. If you take the train, the market is 25 to 30 minute walk. You will walk up rue Jean-Jaures, which becomes Rue de la Republique, to the rue des Marchands to the Place Carnot and then you will keep going East on the rue Carnot, it will become the rue Portail Matheron and leads into place des Carmes. L’isle sur la Sorgue, one of my favorites. 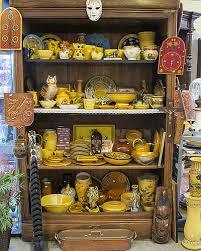 You will find ceramics, paintings, garden ware, Provencal fabrics, quilts, linens, books, kitchenware, silver, some furniture, rustic items. 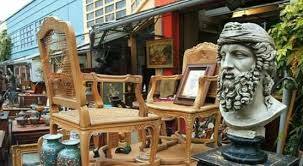 It is an all- day brocante market, from 9am – 7pm, every Sunday on rue des 4 Otages. Parking is not easy but you should be able to a spot on one of the side streets nearby. Nimes. About 80 vendors. You will find ceramics, furniture, Provencal linen, kitchenware, rustic items. The market runs all day on Monday from 8am to 6pm. The market takes place along the Avenue Jean-Jaures in the western part of town. 8 am -6 pm. A lot of vendors will leave early so beware!. If you drive you can find meter parking. if you want to take the train, the train station is in the eastern part of town and within walking distance from the market. When leaving the station take Avenue Feucheres northwest to the Esplanade Charles de Gaulle and the Arena beyond. Continue West, past the Rue Porte de France, until you reach Avenue Jean-Jaures where the market is located. 80 to 100 vendors, you will find furniture, ceramics. tools, hardware, kitchenware, glassware and rustic items and sometimes militaria. Held on Saturday morning from 6 am -2 pm, across the Rhone river from Avignon located on the Place du Marche, alongside the Avenue de Verdun. If you have a car just take a cab, very short trip from Avignon or just take bus #11, which leaves regularly from the post office near Avignon train Station.